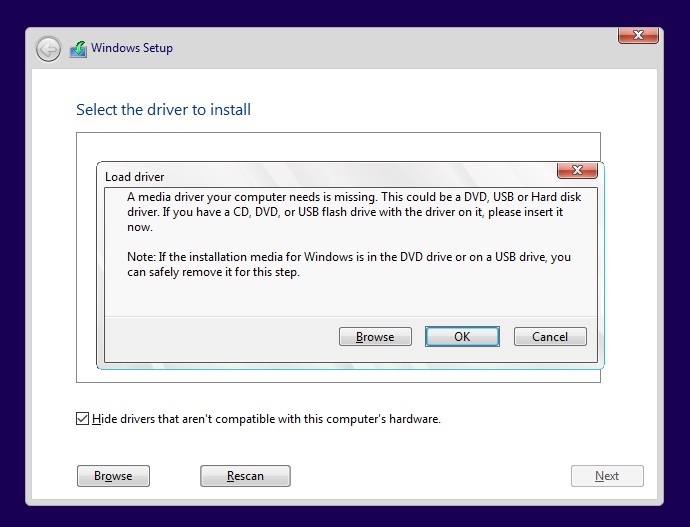 A media driver your computer needs is missing or simply, the driver that needs to recognize the hard drive could not be loaded. We will clarify the real issue that causes this problem. First, let’s take a look at the solutions offered while browsing the internet. “The installation media was ejected while the installation was in progress. It was supposed to remain inside till the installation was complete.” Wow, ok, but if someone removes a media installation before completing the installation, that knowledge is so subtle and we suggest not to deal with that profession. “A low-quality installation media might have been used to install the operating system. In this case, it might not be able to transfer the information completely.” HMMM, this may be true but in very rare cases. “The speed of burning the installation media was to fast. The system was unable to read the drivers properly. The ISO file inside the installation media was corrupt and thus the files containing the drivers missed.” Maybe, but why not stop at another stage but only in the driver activation part. USB media 3.0 in 2.0 port or USB 2.0 in 3.0 port. In this article we described an similiar issue with windows 7, about 3 years ago. It may be a USB memory or portable hard drive older than the operating system itself, but it may also be an unknown brand for which Microsoft has not integrated a driver into the installation files. After Windows starts, a USB memory is installed very easily, but during the operating system installation things are much harder. At least 70% of these diagnoses may be not accurate, though they should be considered as potential causes. I’m the one who knows the cause and the solution of this problem because I first face the problem, I basically study it, then after finding the solution I’m willing to share it with others. Until that stage, it went well because that installation media has been recognized by Bios. My diagnosis on this issue is very simple and clear: There are no drivers loaded for this phase! But why? An Windows 7, 8 or Windows 10 installatiom media consists of 3 crucial files, folders: Boot, Sources and a file without extension Bootmgr. You have downloaded an edited ISO file incorrectly. If you have tried to add another OS installer on the same partition. All 4 or more Windows OS installers: Vista, Windows 7, 8 and 10 contains files, folders with same names: Boot, Sources, Bootmgr etc. Therefore, you can not insert more than one OS installer on the same USB partition. An expert can accomplish this, but will lose a lot of time and may be disappointed because it needs to be very precise. First, find an original untouched Windows 10 ISO. Click here to have it clear how to download an Original ISO from official source. If you want to insert more than one OS installer on the same USB drive or external hdd, create a new partition (if you have enough space) for second OS. Do not use the same partition for 2 or more OS installers. In the above link for download we’ve explained how to create USB installation media. Read that tutorial or watch our video tutorial in YouTube.